We present a new model for real-time character animation with multidimensional, interactive control. The underlying motion engine is data-driven, enables rapid transitions, and automatically enforces foot-skate constraints without inverse kinematics. On top of this motion space, our algorithm learns approximately optimal controllers which use a compact basis representation to guide the system through multidimensional state-goal spaces. These controllers enable real-time character animation that fluidly responds to changing user directives and environmental constraints. Adrien Treuille, Yongjoon Lee, Zoran Popović (2007). 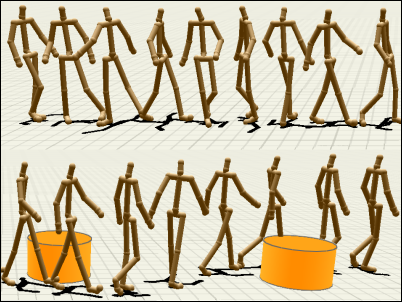 Near-optimal Character Animation with Continuous Control. ACM Transactions on Graphics (SIGGRAPH 2007), 26(3).